India captain Virat Kohli faced flak in Australia for his aggression. Former Australian legend Allan Border and Michael Hussey bashed Kohli over his brashness. India captain Virat Kohli faced flak in Australia for his aggression. Former Australian legend Allan Border and Michael Hussey bashed Kohli over his brashness. 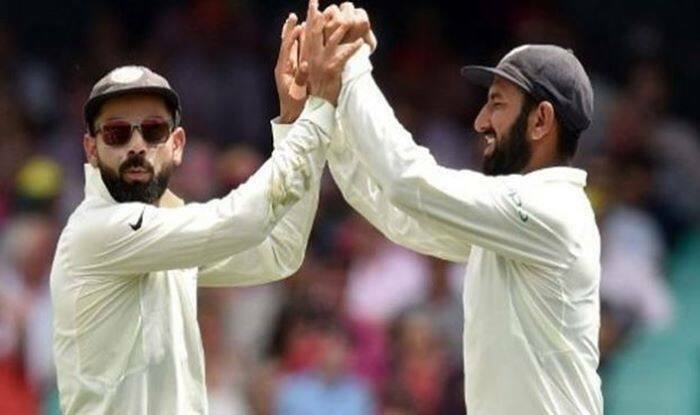 Now, India top-order Test batsman Cheteshwar Pujara has come out with his side of the story and made a claim that Kohli has not been disrespectful towards anyone. Pujara has explained that that is Kohli and his his natural instinct. “Even their media is always supporting their team. If you make any error, they always let the opponents know. So, as an Indian player, if there’s something wrong, or even if there is a minor discussion in the team, and if their media-person gets to know, then they’ll always go behind that player. It’s part of their strategy, which we understand. There’s a little bit of sledging which is going on. But luckily, I’m someone who doesn’t get affected. In fact, I get motivated when they try and sledge me,” added Pujara, who scored 521 runs in the four-match series at an average of 74.42.